The mortgage on the movable property is called hypothecation. But hypothecation differs from the mortgage in two respects. Firstly, mortgage relates to immovable property whereas hypothecation relates to movables. A charge is created on property or goods for the amount of the debt in case of hypothecation. The owner, however, retains his ownership as well as possession. Thus, in hypothecation, the goods remain in the possession of the borrower and are equitably charged to the lender under documents signed by the borrower. This document which creates charge on the security is called Letter of Hypothecation. 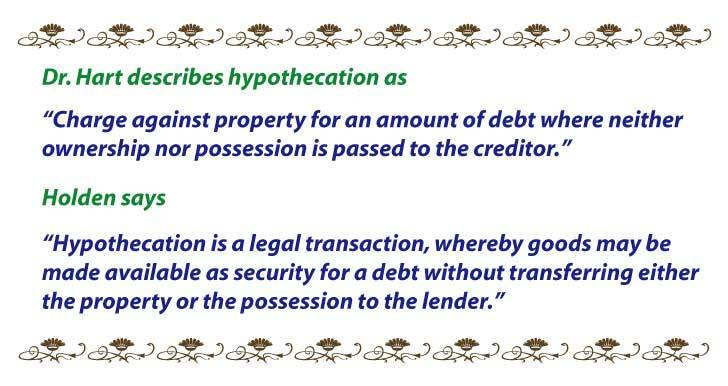 In the said document, the debtor binds himself to give possession of the hypothecated goods to the lender, the charge of hypothecation is thus converted into that of a pledge and the banker or the hypothecate enjoys the powers and rights of a pledge. The Delhi High Court under M/S Gopal Singh Hira Singh vs Punjab National Bank observed that in case of hypothecation. The high court, therefore, concluded that in law there was no difference between a pledge and hypothecation with regard to legal possession of the banks the hypothecation goods are also not only constructively but actually in the possession of the bank. Hypothecation is a convenient device to create a charge over the movable assets under circumstances where the possession of the goods is either inconvenient or impracticable. For example, if a manufacturer wants to borrow on the security of raw materials or stock-in-process which are in the process of being manufactured into finished products and which require constant handling in a factory, transfer of possession will hamper production. By hypothecation of the stock, the borrower may use the stock as he likes. This facility is also desired by small traders and businessmen who cannot offer their stock for pledge because of constant fluctuation but can only offer hypothecation of stock in their shops or showrooms etc. Hypothecation is a floating charge on the borrower’s assets at present and in future. The position of the banker in hypothecation is not very safe. It is rather precarious. If the borrower, in possession of goods, sells them to a bonafide purchaser for value without notice of hypothecation, the purchaser gets a good title to the goods and the hypothecate cannot proceed against them. If the hypothecator, in possession of goods, makes a valid pledge of goods and the pledge has no notice of the hypothecation, the claim of the hypothecate will be postponed to that of the pledge. As in hypothecation mortgage, the goods remain in the possession of the borrower, the facilities should be granted only to those parties whose financial should be granted only to those parties whose financial stability and commercial integrity is beyond doubt. The first statement of stock must be obtained at the time of execution of documents and verified and, the same is generally attached to the hypothecation document. The banker should obtain a periodical statement of stocks duly signed by an authorized person with valuation as per involves. The stock statements usually contain a declaration by the borrower regarding his clear title to the goods and the correctness of the quality, quantity, and valuation thereof. On receipt of the statement, drawing limits are calculated. So regular submission of a correct statement of stock is a must in this kind of advance. Periodical inspection of the goods hypothecated must be conducted by the bank officials and the correctness of the stock statements submitted by the borrower verified. Strict vigilance and careful supervision of the stock are essential in such advances. Where physical inspection by the bank officials is not possible, the go-down keeper should be asked to send periodical reports. Stocks should be fully insured against fire, burglary and other risks in joint names with Bank Clause. To avoid the risk of a second charge being created, a nameplate of the bank mentioning that the stocks are hypothecated must be displayed at a prominent place for public notice in the business premises of the borrower where the stocks are kept. In case of the borrower is a Joint Stock Company, the bank’s charge must be registered with the Registrar of Joint Stock companies within a period of 21 days of the creation of the charge. In case, it is not registered within this period, it becomes void against the liquidator and/or any other creditor of the company. Where the company’s financial position does not justify granting of an advance on hypothecation basis, it is sometimes reinforced by the personal guarantee of its directors where they are persons of substantial means. Personal guarantee of directors is usually taken in the case of advance to private companies. Some collateral security, sufficient in value, such as mortgage of immovable property belonging to the borrower or to the guarantor, should be insisted upon. Only fresh, easily saleable and marketable goods should be advanced against. Old stocks or out-of-date/damaged goods must not be accepted. In case the borrower is allowed to avail himself of credit facilities against hypothecation of stocks from various banks, it should be ensured that such stocks are segregated or demarcated in different godowns/shops and the same are properly recorded in separate stock books so as to facilitate easy verification by bank officials. What is Second Mortgage on Bank Loan?